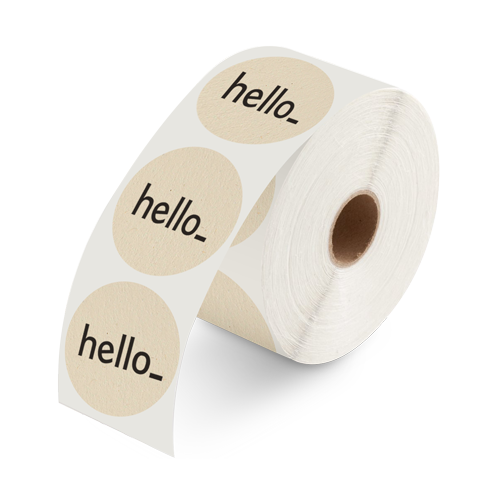 These labels on roll from Helloprint are perfect for labelling wine and beer bottles or jars and can be applied manually or with the use of a labelling machine. Choose between different types of material, including a eco-friendly option of the Woodstock betulla recycled. If you wish to use a labelling machine you can select few extra options such us the width of the roll and the direction of the labels on the roll. If you need any extra option, shape of the label, finishing or different quantities is possible - just get in touch! Are labels on roll no dispenser eco fit for usage outside? How many labels fit in a box/dispenser? What is the diameter of the inside of the roll? To allow leeway for cutting differences in production, always add a bleed of 2 mm around all edges of your design. Make sure colours, background pictures and layouts extend into the bleed area so as to avoid leaving white lines as a result of cutting tolerances. You can submit your file with crop marks and printer's marks. Labels on roll no dispenser eco are comparable to stickers. The difference is that labels are produced on a roll and not as seperate stickers making them easier to dispense and utlilise. Labels on roll are often use when you need to label different items in a short period of time. For the delivery of your labels on roll no dispenser eco we use multiple carriers. Because of the highest reliability, in most cases we use UPS or DPD. Not all adhensive labels are suitable for outdoor use. If you want to use a label outside, we recommend 90 grams white or transparent PVC. Keep in mind that the lifespan of the labels is influenced by the weather conditions. A label that is used outside has a shorter lifespan than a label used inside. If you want to write on your labels we recommend using the adhensive 73 gram writable paper. This depends on the size of the labels. The larger the size, the less labels are fitted per rol. The diameter of the inside of the roll is 76mm.